DURHAM, N.C. – Agents and corporate employees of National Agents Alliance volunteered during the Duke Children’s Hospital MIX 101.5 WRAL-FM Radiothon on Feb. 12, helping raise more than $1.1 million during the two-day event. NAA was also a “Circle of Hope” sponsor for the event. 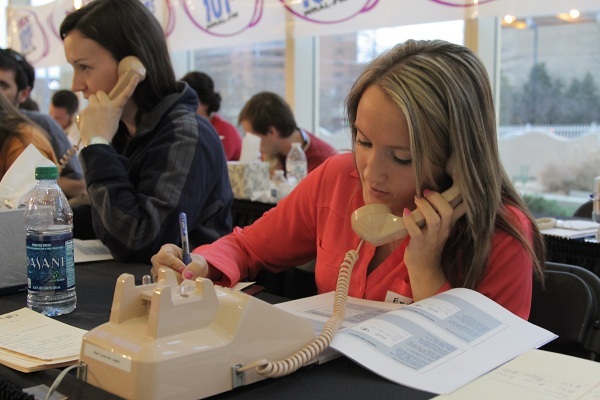 The radiothon is Duke Children’s Hospital’s largest single fundraising event annually. It raises funds to benefit children’s programs and supports the continuation of excellence within the medical and surgical programs housed at Duke Children’s Hospital. The MIX 101.5 Radiothon for Duke Children’s raises more money per capita than any other Children’s Miracle Network Hospital’s Radiothon in the U.S. or Canada. The event has raised nearly $15.4 million in the last 19 years thanks to donations from listeners, sponsors, patient families and hundreds of volunteers. Josh Hewitt, Associate Director of Development at Duke Children’s Hospital, said roughly 200 people volunteered to help the event a success. Volunteers come from corporate sponsors, former patients and patients, doctors and physicians from the Triangle area and individuals that just want to help make the event successful. In the three hours that members of The Alliance volunteered, more than $200,000 was raised. A group of around 60 people worked the telephone to take pledges and also called friends and family to raise money. National Agents Alliance Agency Manager Aaron Guetterman and his wife, Dana volunteered on behalf of The Alliance. He said it felt good to give back to such a worthy cause. Erika Teer, a recruiter at NAA’s corporate office, said she enjoyed meeting people from other industries during her shift. weekly visits to both inpatient and clinic areas by clowns, mimes, magicians and singers in our Make ‘em Smile program. National Agents Alliance is an innovative lead generation and marketing organization that sells life insurance, annuities, and other financial services products through more than 7,000 active independent sales representatives in 50 states. Focused on serving middle-income families, National Agents Alliance is the No. 1 United States provider of mortgage protection insurance and offers a broad array of other affordable products from highly regarded companies such as Mutual of Omaha, Foresters, ING, etc. Since its inception in 2002, National Agents Alliance has helped more than 950,000 families successfully apply for more than $99 billion in life insurance coverage since 2002.